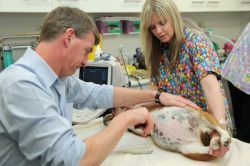 Even though as veterinarians we are well skilled to detect illness in dogs and cats, the clinical examination is limited in how much information it gives us. This means at times we will need to run blood and urine tests to further evaluate the health status of your pet and to determine the effect of medications on your pet. More complex blood testing & tissue analysis are sent to a commercial Vet Pathology Laboratory on a daily basis.